Muskerry News | O’Learys Centra is top ten in Ireland! O’Learys Centra is top ten in Ireland! 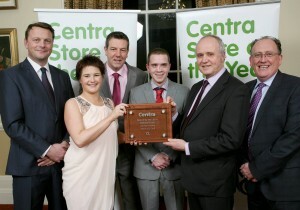 O’Leary’s Centra in Tower was announced as one of ten finalists in the Centra Store of the Year Awards 2014 recently. All 465 Centra stores throughout the Republic of Ireland are audited for the annual Centra Store of the Year competition, with just ten finalists selected from the nationwide network of stores. On receipt of his finalist award, Store Owner Paddy O’Leary paid tribute to his team acknowledging their dedication, professional approach and attention to detail. “We are delighted with this recognition as it reaffirms the work we do to provide our customers with a top-class local shopping facility. Our team are specialists in delivering first-rate customer service and excellent value to customers. This award also acknowledges the emphasis our store places on delivering superb fresh food, supporting local suppliers and sustaining local employment.” he said.